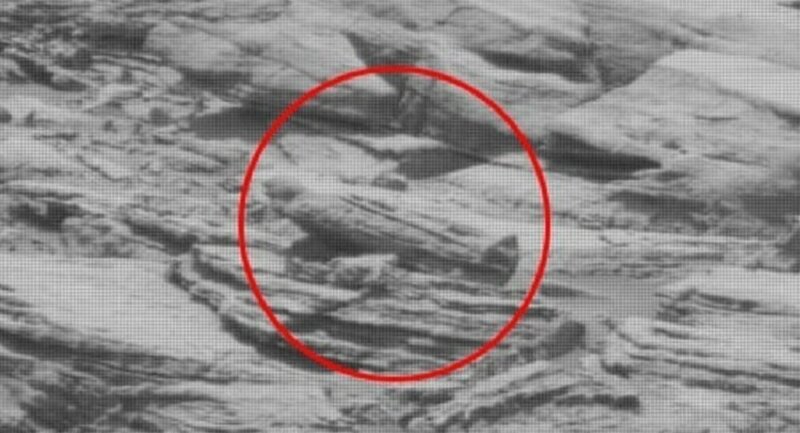 While scientists continue to sift through the data supplied by research spacecraft and rovers in order to determine whether the desolate plains of planet Mars harbour vestiges of life or perhaps even remnants of some long-lost civilisation, dedicated UFO hunter Scott C. Waring has claimed that one NASA photo of the Martian surface shows an "alien sarcophagus". Commenting on the picture in his blog UFO Sightings Daily, Waring insisted there are actually three sarcophagus to be seen there, "but two had fallen the other direction and only one had fallen towards us, which allows us to see its lid". "The lid of the sarcophagus has a figure of person on it. It’s easy to make out the head, shoulders and body on top of the lid", he wrote. Waring also claimed that he found "loads of other ancient artefacts" in the picture, including "some ancient pillars, structures and many other objects that clearly were made by intelligent beings", as well as "a sitting figure of a person". "The culture seems to have ended during a time similar to Earths moment in history before the great pyramids were made", he speculated. Previously, Waring made a number of shocking claims while studying NASA pictures of various celestial bodies, uncovering the alleged presence of alien base on the Moon or suspected alien tech on asteroid Bennu. NASA, however, attributed at least one of his discoveries to pareidolia – a psychological phenomenon where people see recognisable shapes in clouds, rock formations, or otherwise unrelated objects or data.